This was really fun to make. It's no masterpiece or anything, but Id love to hear what you think. I would really like to see a UCS Speeder bike. Tie between Snowspeeder and Speeder bike. Especially after the Shadows Of The Empire game (N64) Speeder bike level. Super Nostalgic! This is a Snowspeeder build with a pretty good skit. 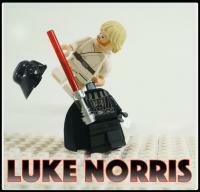 Lego Chuck Norris Facts - Animated Video Here is a short I threw together. Love to hear what you thought! Here is 1 more, for anyone who enjoys. I just rebuild them, for now. Soon, I will have much better slow motion, so I can have some large crystal clear HD explosions. After that, they will probably go into color coded bins for spare parts and MOCs, if I can't at least partially rebuild. It's weird, but I actually have more sentiment for the broken destroyed sets than pre-destruction sets. It's like the beat up, old, dirty baseball that Babe Ruth knocked out of the park. There are some sets like this Kwik-E-Mart though, that I love so much I will have to buy 1 for destruction & 1 for me. The corner pieces sometimes dent, or the top pieces if I drop something on them. I have created a few flat bricks, lol. I usually have 1 or 2 pieces that show some damage per video (aside from the torch video, total loss). However, I haven't lost any exclusive pieces, just bricks that have spares of lying around, so I still have these rebuilt sets that are pretty flawless... for the time being! Kwik-E-Mart Build and Smash! My new favorite set! Here's the Kwik-E-Mart! and yes, I drop it, too. The Simpsons House Build and smash. Enjoy. Here's something a little less violent.